The pumps are available with or without stirring nozzle. At a pit depth of 3.50 meters , an additional stirring nozzle is advisable. Universal applications; option for a second oil chamber at a pump length of 5 meters. Pumps are as well available in stainless steel (V2A, material no. 1.4301 AISI) at additional charge. Receiving cesspit or receiving tank, mixing tank. 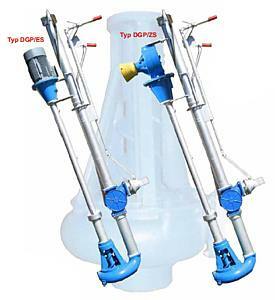 The thick slurry pump DGP is available also as a center box-type pump. Depending on the medium, the pump can be equipped with top entry or bottom entry, with face seal and oil filling or with greasable plain bearings. The thick slurry pump DGP is a very solid and efficient device. The scope of delivery can be defined individually. Easy and fast installation which can be carried out under own management. Maintenance is limited to visual and acoustic check and oil level control.